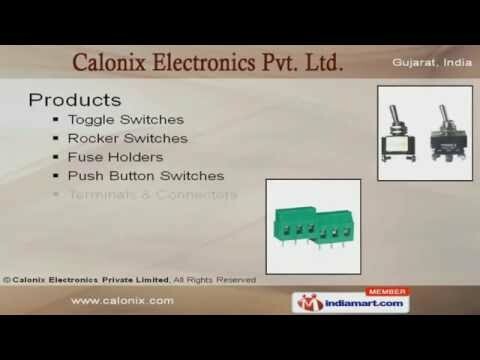 Welcome to Calonix Electronics Pvt Ltd. Manufacturer & Exporter of Electronic Goods. The company was incepted in 1982, at Vadodara. Approved by CACT, C-DoT, LCSO, we are recognized by the National Accreditation Board for Testing & Calibration Lab and are tested by DQA, MoD, GoI & ERDA. Superior quality, In-house Tool, Die-Room, Efficient performance & shock resistance are some of the features that distinguish us from others. Our product range covers Fuse Holders, Push Button Switches, Terminals & Connectors.We offer an exotic range of Toggle Switches that are available in different specifications to suit diverse demands of our clients.We provide an excellent gamut of rocker switches, which are engineered using high grade raw material, in compliance with the industry guidelines.Our range of Fuse Holders are highly efficient in performance.Push button switches have attained great acknowledgment due to their excellent efficiency & durability.We ensure our customers about long service life of our terminals & Connectors that are made from high grade material.